The TRD Sport trim adds important features both inside and outside the vehicle, and Edmunds is a big fan of the Tacoma’s go-anywhere design, writing, “Off-road, the Tacoma is ready for just about anything with its considerable ground and body clearances.” Check out Watermark Toyota’s selection of high performance Tacoma models in the TRD Sport trim today. 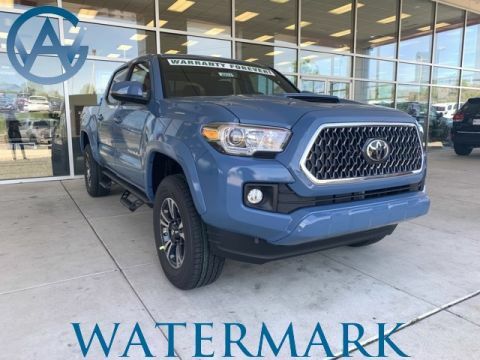 Tacoma TRD Sport V6 Double Cab, 4WD, CAVALRY BLUE, Watermark's Warranty Forever, 120V/400W Deck Mounted AC Power, Auto-Dimming Inside Rear-View Mirror w/Compass, Blind Spot Monitor w/Rear Cross Traffic Alert, Color-Keyed Overfenders, Engine Immobilizer, LED Daytime Running Lamps, Navigation System, Power Sliding Rear Window w/Privacy Glass, Rear Parking Assist Sonar, Smart Key w/Push Button Start, Technology Package, TRD Sport Package (PY), Variable Intermittent Wipers, Wheels: 17" x 7.5" Machined Alloy, Wide Angle Front Fog Lamps. 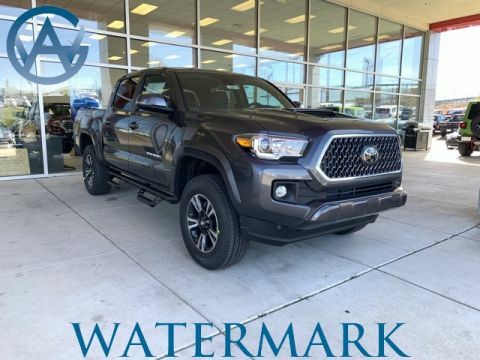 2019 Toyota Tacoma TRD Sport The Watermark Warranty Forever is valid for as long as you own the vehicle & for an unlimited time, unlimited miles. How much is it? Zero. We're building "Customers for Life" so the Watermark Warranty Forever comes standard with every qualifying vehicle meeting the criteria and is included at no extra charge. There are no catches, hidden fees, or gimmicks. Our dealership provides this product as an added value to our Customers for doing business with us. Tacoma TRD Sport V6 Double Cab, 4WD, Cement, Graphite Cloth, 120V/400W Deck Mounted AC Power, All Weather Liners & Door Sill Protectors, Auto-Dimming Inside Rear-View Mirror w/Compass, Blind Spot Monitor w/Rear Cross Traffic Alert, Carpet Floor Mats & Door Sill Protectors Package, Color-Keyed Overfenders, Door Sill Protectors, Engine Immobilizer, Four Season Floor Mat Package, LED Daytime Running Lamps, Navigation System, Power Sliding Rear Window w/Privacy Glass, Rear Parking Assist Sonar, Smart Key w/Push Button Start, Technology Package, TRD Sport Package (PY), Variable Intermittent Wipers, Wide Angle Front Fog Lamps. 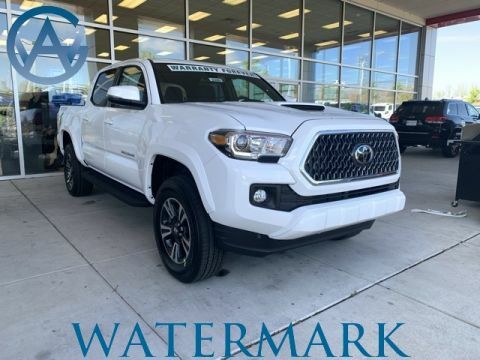 2019 Toyota Tacoma TRD Sport The Watermark Warranty Forever is valid for as long as you own the vehicle & for an unlimited time, unlimited miles. How much is it? Zero. We're building "Customers for Life" so the Watermark Warranty Forever comes standard with every qualifying vehicle meeting the criteria and is included at no extra charge. There are no catches, hidden fees, or gimmicks. Our dealership provides this product as an added value to our Customers for doing business with us. Tacoma TRD Sport V6 Double Cab, V6, 4WD, Silver Sky Metallic, Watermark's Warranty Forever, 120V/400W Deck Mounted AC Power, Auto-Dimming Inside Rear-View Mirror w/Compass, Color-Keyed Overfenders, Engine Immobilizer, LED Daytime Running Lamps, Navigation System, Power Sliding Rear Window w/Privacy Glass, Smart Key w/Push Button Start, TRD Sport Package (PY), Variable Intermittent Wipers, Wheels: 17" x 7.5" Machined Alloy, Wide Angle Front Fog Lamps. 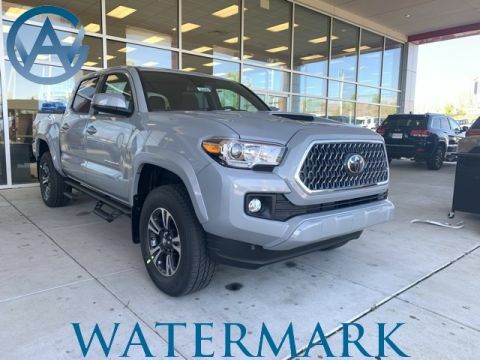 2019 Toyota Tacoma TRD Sport The Watermark Warranty Forever is valid for as long as you own the vehicle & for an unlimited time, unlimited miles. How much is it? Zero. We're building "Customers for Life" so the Watermark Warranty Forever comes standard with every qualifying vehicle meeting the criteria and is included at no extra charge. There are no catches, hidden fees, or gimmicks. Our dealership provides this product as an added value to our Customers for doing business with us. Tacoma TRD Sport V6 Double Cab, V6, 4WD, Magnetic Gray Metallic, 120V/400W Deck Mounted AC Power, Auto-Dimming Inside Rear-View Mirror w/Compass, Blind Spot Monitor w/Rear Cross Traffic Alert, Color-Keyed Overfenders, Engine Immobilizer, LED Daytime Running Lamps, Navigation System, Power Sliding Rear Window w/Privacy Glass, Rear Parking Assist Sonar, Smart Key w/Push Button Start, Technology Package, TRD Sport Package (PY), Variable Intermittent Wipers, Wide Angle Front Fog Lamps. 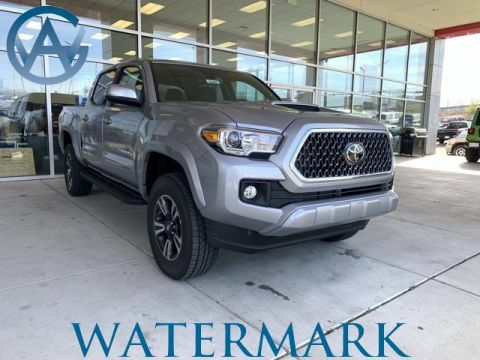 2019 Toyota Tacoma TRD Sport The Watermark Warranty Forever is valid for as long as you own the vehicle & for an unlimited time, unlimited miles. How much is it? Zero. We're building "Customers for Life" so the Watermark Warranty Forever comes standard with every qualifying vehicle meeting the criteria and is included at no extra charge. There are no catches, hidden fees, or gimmicks. Our dealership provides this product as an added value to our Customers for doing business with us. 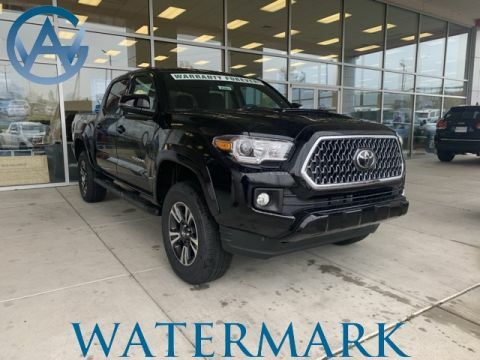 Tacoma TRD Sport V6 Double Cab, V6, 4WD, Midnight Black Metallic, Watermark's Warranty Forever, 120V/400W Deck Mounted AC Power, All Weather Liners & Door Sill Protectors, Auto-Dimming Inside Rear-View Mirror w/Compass, Carpet Floor Mats & Door Sill Protectors Package, Color-Keyed Overfenders, Door Sill Protectors, Engine Immobilizer, Four Season Floor Mat Package, LED Daytime Running Lamps, Navigation System, Power Sliding Rear Window w/Privacy Glass, Smart Key w/Push Button Start, TRD Sport Package (PY), Variable Intermittent Wipers, Wide Angle Front Fog Lamps. 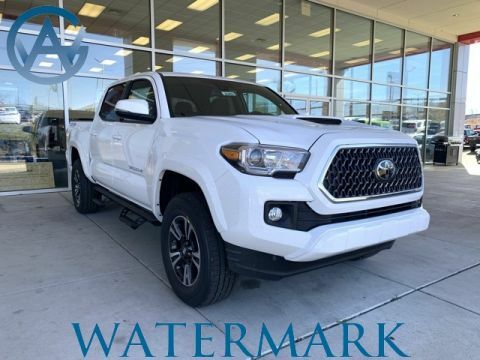 2019 Toyota Tacoma TRD Sport The Watermark Warranty Forever is valid for as long as you own the vehicle & for an unlimited time, unlimited miles. How much is it? Zero. We're building "Customers for Life" so the Watermark Warranty Forever comes standard with every qualifying vehicle meeting the criteria and is included at no extra charge. There are no catches, hidden fees, or gimmicks. Our dealership provides this product as an added value to our Customers for doing business with us. Tacoma TRD Sport V6 Double Cab, 4WD, Super White, Watermark's Warranty Forever, 120V/400W Deck Mounted AC Power, Alloy wheels, Auto-Dimming Inside Rear-View Mirror w/Compass, Blind Spot Monitor w/Rear Cross Traffic Alert, Color Keyed Rear Bumper, Engine Immobilizer, LED Daytime Running Lamps, Navigation System, Rear Parking Assist Sonar, Smart Key w/Push Button Start, Steering wheel mounted audio controls, Technology Package, TRD Sport Package, Wide Angle Front Fog Lamps. 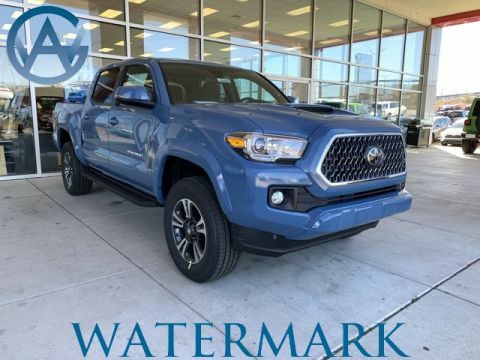 2019 Toyota Tacoma TRD Sport The Watermark Warranty Forever is valid for as long as you own the vehicle & for an unlimited time, unlimited miles. How much is it? Zero. We're building "Customers for Life" so the Watermark Warranty Forever comes standard with every qualifying vehicle meeting the criteria and is included at no extra charge. There are no catches, hidden fees, or gimmicks. Our dealership provides this product as an added value to our Customers for doing business with us. Tacoma TRD Sport V6 Double Cab, V6, 4WD, Cement, Watermark's Warranty Forever, Bluetooth Connection, 120V/400W Deck Mounted AC Power, Auto-Dimming Inside Rear-View Mirror w/Compass, Blind Spot Monitor w/Rear Cross Traffic Alert, Color-Keyed Overfenders, Engine Immobilizer, LED Daytime Running Lamps, Navigation System, Power Sliding Rear Window w/Privacy Glass, Rear Parking Assist Sonar, Smart Key w/Push Button Start, Technology Package, TRD Sport Package (PY), Variable Intermittent Wipers, Wheels: 17" x 7.5" Machined Alloy, Wide Angle Front Fog Lamps. 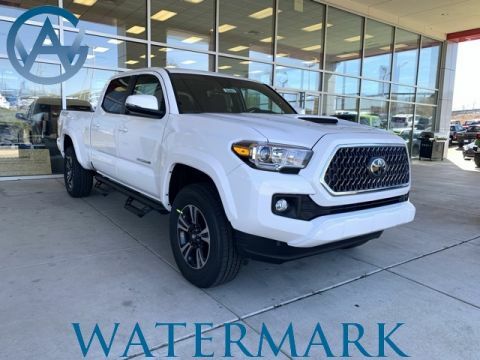 2019 Toyota Tacoma TRD Sport The Watermark Warranty Forever is valid for as long as you own the vehicle & for an unlimited time, unlimited miles. How much is it? Zero. We're building "Customers for Life" so the Watermark Warranty Forever comes standard with every qualifying vehicle meeting the criteria and is included at no extra charge. There are no catches, hidden fees, or gimmicks. Our dealership provides this product as an added value to our Customers for doing business with us. 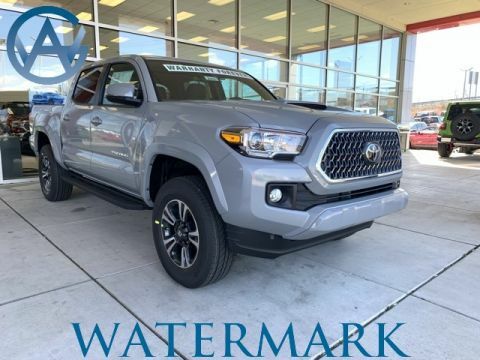 Why Buy a New Toyota Tacoma TRD Sport from Watermark Toyota? 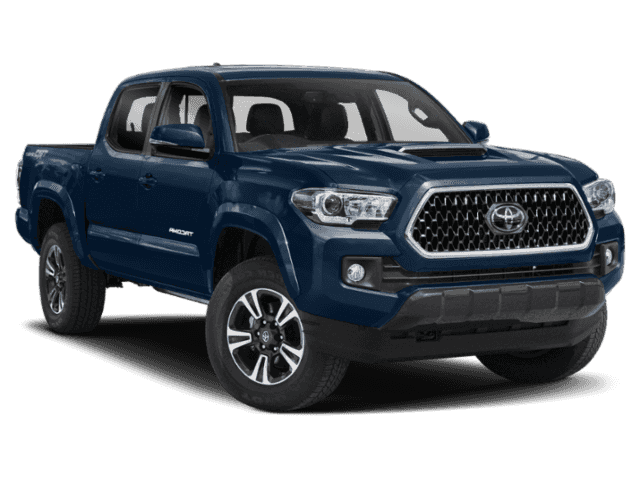 Our financing department is happy to help you figure out which financing package is right for you, and you can schedule a test drive online to try out the Tacoma TRD Sport in person. Any questions? Visit Watermark Toyota at 1055 Crossing Place in Madisonville, KY to learn more.